This summer took a completely different direction then what we originally intended. 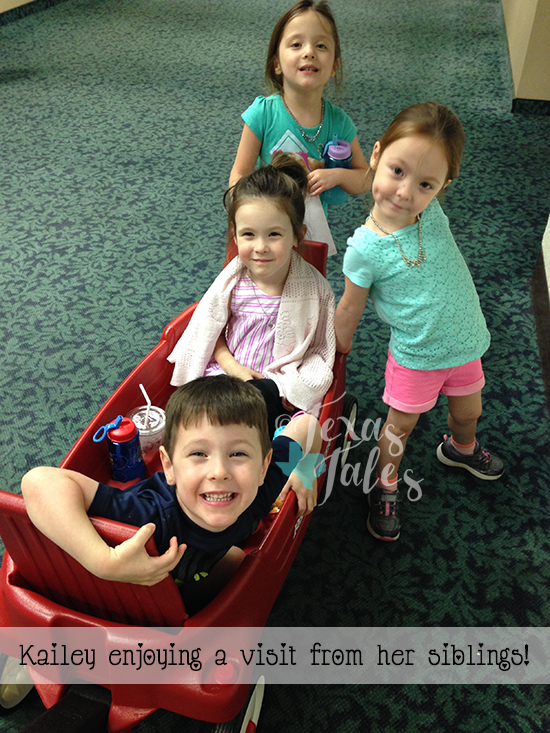 As school came to a close in the spring, we began to get excited about various outings, lots of time at the pool with the kids and late mornings. But first I wanted to get Kailey's heart checked out as I'd had a nagging feeling for quite awhile that something was wrong. Despite having medical professionals tell me she sounded fine, I insisted on a referral to a pediatric cardiologist and got an appointment for her. 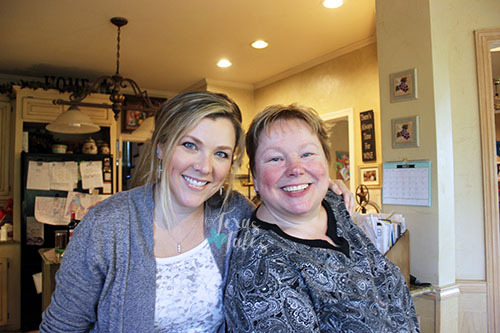 I wasn't sure exactly what I was expecting them to find—maybe something off with her heart beat that could be corrected with medication—but what we discovered was much more serious. 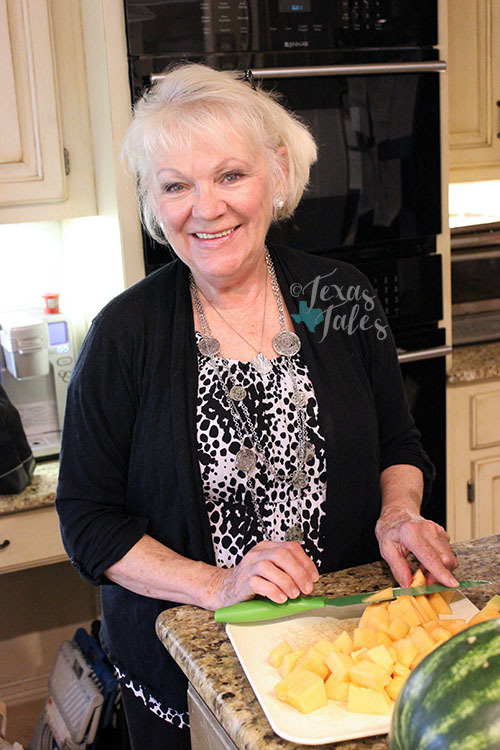 She had a massive hole between the two atriums of her heart known as an Atrial Septal Defect (ASD) and needed open heart surgery within six to eight weeks to close it. The combination of a mother's instinct and the Holy Spirit is a powerful thing. Powerful enough that it saved my daughter's life in a situation we never thought we'd find ourselves. The past two months or so have been a mixture of traumatic, stressful, spiritual, challenging, inspiring and hopeful. 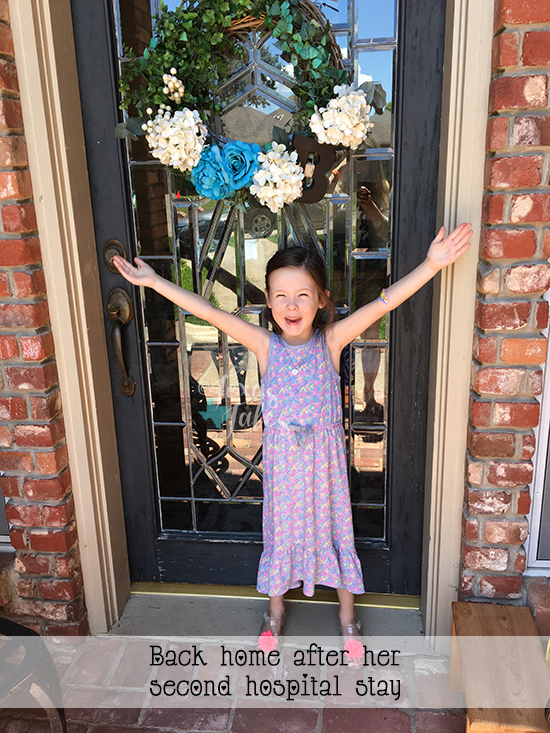 We are extremely grateful and blessed to now say that "relief" is also part of that journey, ever since my sweet girl had her heart surgery on July 12. 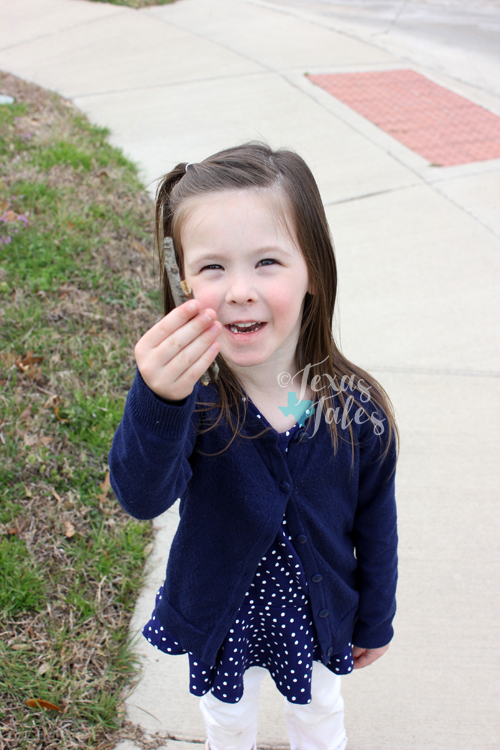 We had known since our days in the NICU that she was born with a heart murmur. I honestly can't recall if she was given an echocardiogram at that time or not, but we were told she was otherwise healthy and moved on with our babies once they were all released one by one to come home. 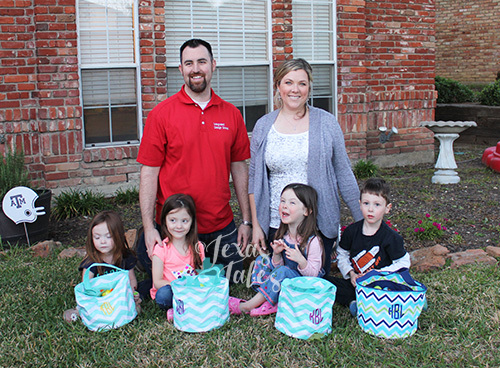 Two months after their delivery, we had the four of them under our roof and began life as a family of six with 32 bottles to give every 24 hours and about 60 minutes of sleep as new parents to quadruplets. 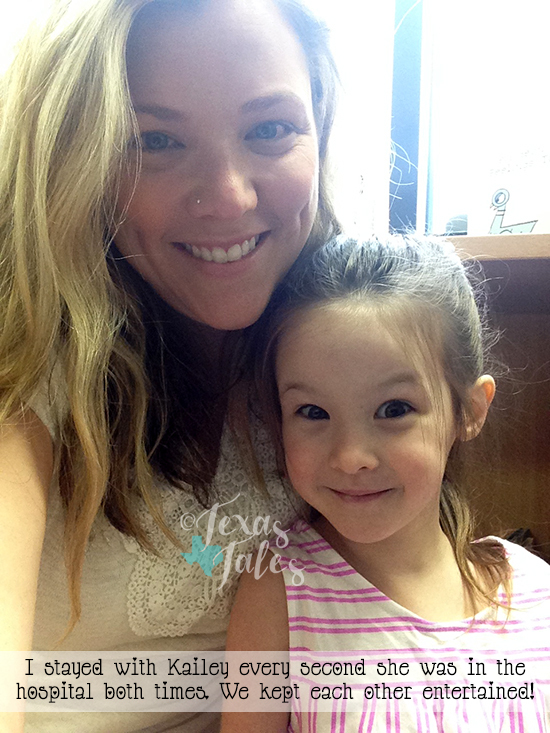 There were follow-up doctor visits to check potentially worrisome issues with their eyes, with Kailey's hips and so on. But her extreme far sightedness actually correct itself as she grew and her hip dysplasia did as well. Logan and Trystan were both in great health and despite Harrison's serious illness in the NICU, he has zero complications to this day. Just two small scars—one on each side of his chest—to remind us of that day in particular we nearly lost our little boy. 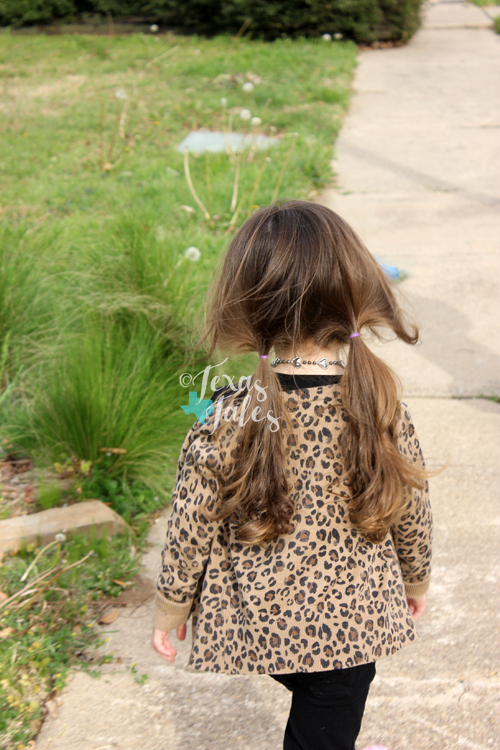 As the kiddos grew and especially within the last year, I noticed that Kailey's heart seemed to beat extra hard and that it raced at times even though she'd be at complete rest and it should have been beating calmly and rhythmically. Any time we went to our pediatrician office, I'd ask him or her to listen to her heart and see if there was reason to be concerned. 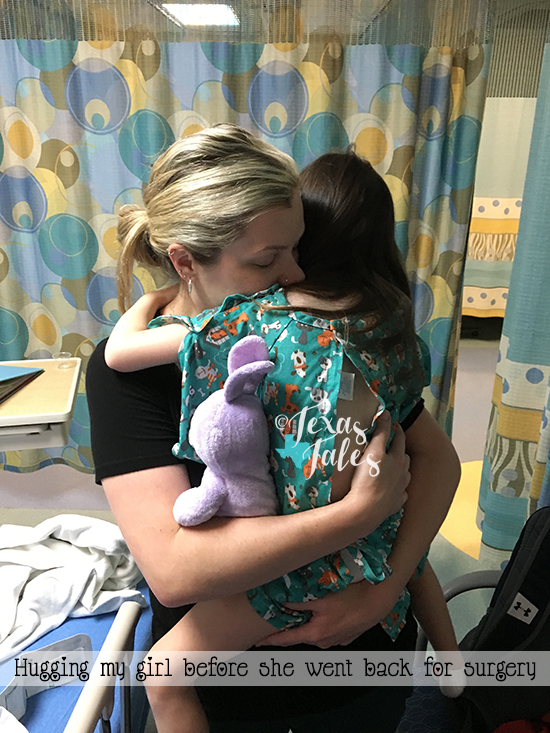 Earlier this year, we had a small issue arise that led to getting Kailey's kidneys completely checked out (which they did, everything turned up normal) and I also asked additional medical professionals to listen to and feel her heart. But everyone told me the same thing—she seems fine. However, when we went to the pediatric cardiologist they had barely completed the EKG before whisking her into another room where one of the cardiologists himself performed the echo Kailey and diagnosed the ASD. It was just myself and my little girl at the appointment that day and I remember going into shock as I was leaving the building and wondering how this could be happening. Turns out, it was a congenital heart defect, meaning she was born with it. And it also turned out, that we caught it just in time. The cardiologist assured me that we couldn't have had an operation on it until about the time she was four so our timing was perfect. But he also gently let me know that the hole was so large that had this gone undetected for even a few more years the results would have been fatal. 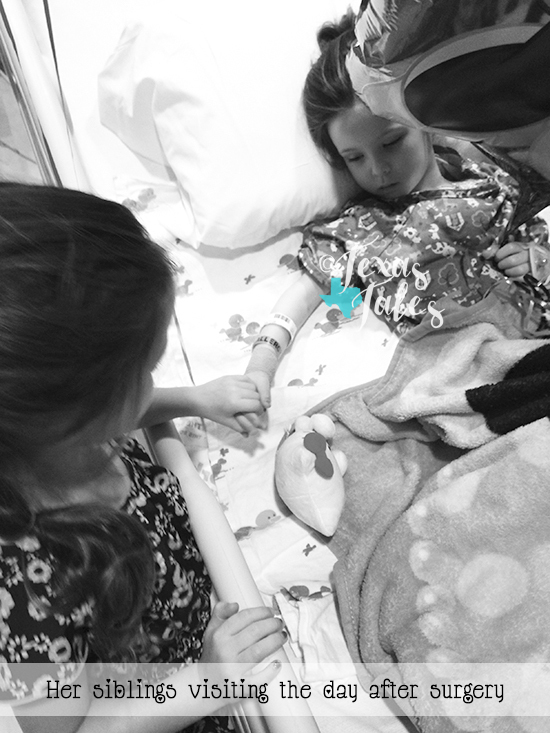 The hole in Kailey's heart means that the wall that typically separates the heart's two upper chambers, known as the left atrium and right atrium, was compromised. In Kailey's case, there was almost no atrial septum or wall there. So a great deal of her oxygen-rich blood or red blood was pouring into the atrium that houses the oxygen-poor or blue blood, thus causing the right side of her heart to become very enlarged with all the extra blood being forced into it. A person's heart, we learned, actually sits at a slight angle with the right side pointing more toward the front of the chest. Since the right side of Kailey's heart was so enlarged that made it closer to her chest wall and was why I could feel it beating so prominently with just my hand. Since the day of the diagnosis, I've learned more about congenital heart defects and complications than ever. We learned that small ASDs can often close on their own over time or even be closed by a minimally-invasive catheter surgery using an artery in the leg. 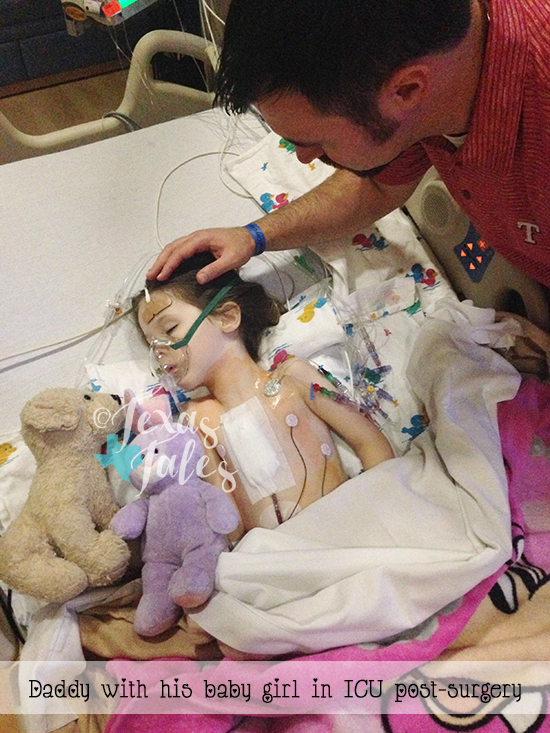 But more extreme cases, like Kailey's, require open heart surgery. 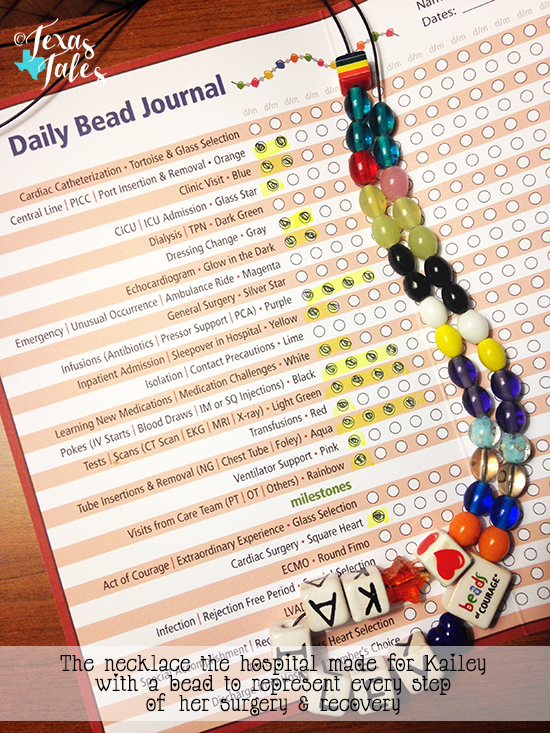 Immediately, the husband and I began to educate ourselves on pediatric open heart procedures and everything it entailed, what to prepare for, what kind of recovery to expect and long-term effects. 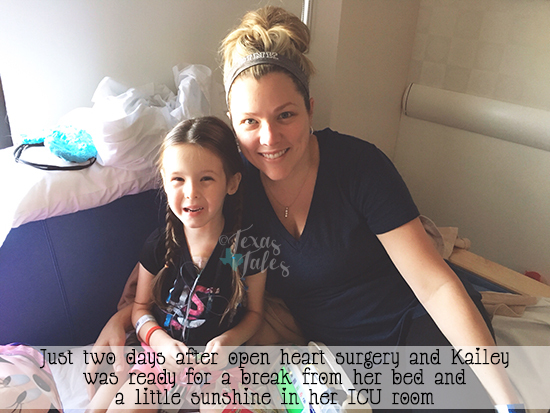 The silver lining of having open heart surgery meant the fix would be final and there would be no need for Kailey to ever undergo any of this again. 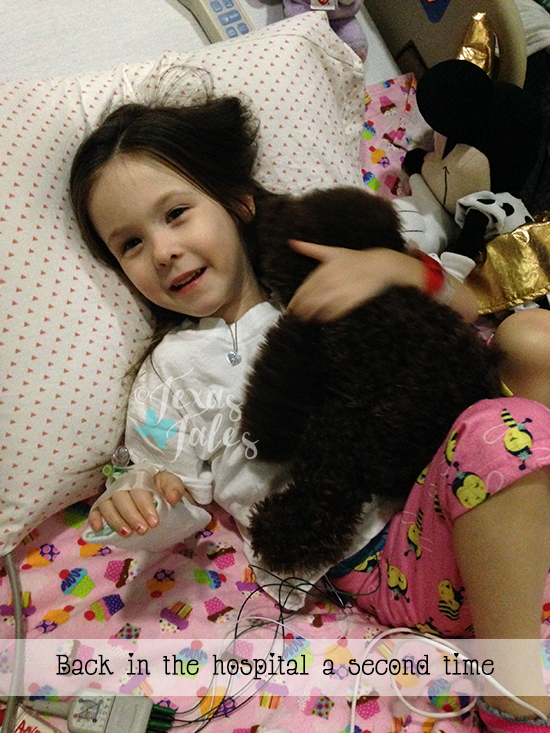 We spoke with several surgeons, one even out of state, to both confirm the best course of treatment for Kailey and also ask lists of questions we had about the surgery, ASD repair and recovery. By the time we met with Dr. Eric Mendeloff, founder of the Congenital Heart Surgery Unit (CHSU) at Medical City Children's Hospital in Dallas, we felt that we had learned everything we needed to know and that we'd also met the best surgeon for the job. Dr. Mendeloff and his staff at the CHSU were phenomenal and we will always be grateful to them for their profound care and saving our little girl's life. Not a day has gone by since Kailey's surgery that I don't thank God for giving me that "feeling" that something was wrong and leading me to the right place to diagnose Kailey and repair her heart. My mother's instinct has never steered me wrong and I know I have Him to thank for that! It has been been just over one month since surgery and we truly cannot believe everything Kailey has gone through or how amazing she looks and acts now! 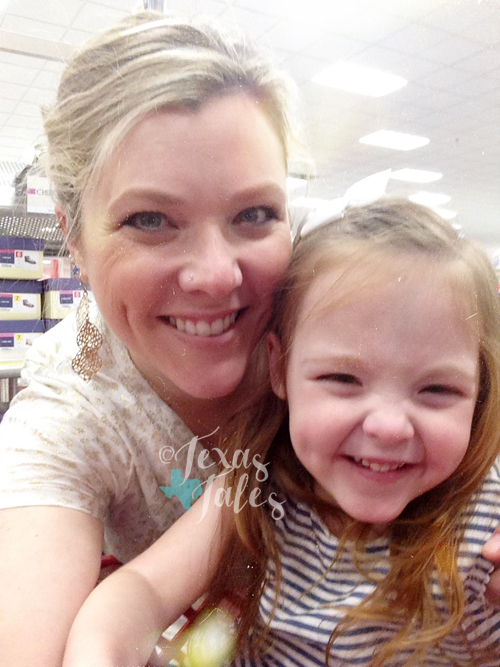 Recounting this journey so soon after—especially since we had to make a return trip to the ICU due to complications less than one week after being released from the hospital—is certainly full of emotions for me as a mama. But prior to Kailey's surgery, I'd found some books and blogs and other information that proved vital to us surviving this journey as a family and also to help prepare ourselves as parents, Kailey as a patient and her siblings as her support team in what was to come and how things would happen. 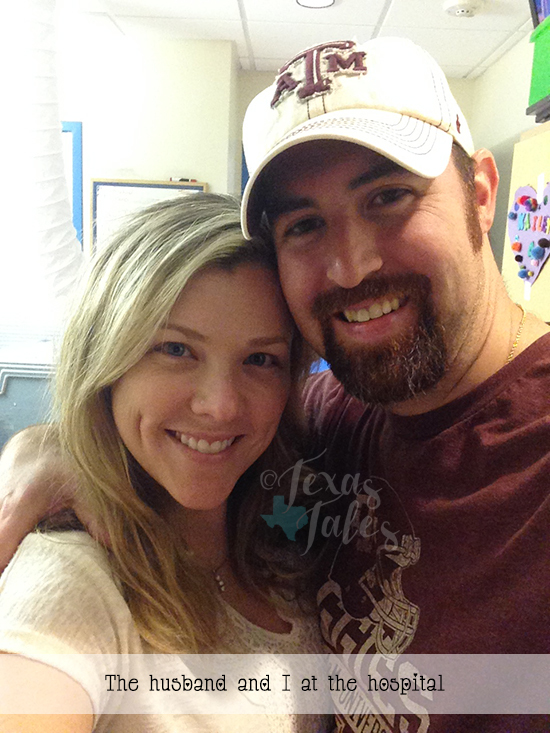 Just like I've shared my experience with a quad pregnancy and having and raising quadruplets, the husband and I agreed we needed to share this unique journey as well for those coming behind us that find themselves facing the same or a similar diagnoses and those overwhelming and fearful feelings of the unknown. I'll be back soon with additional posts about the day of surgery, her recovery, the things we used to help prepare, what to pack for a week in the ICU and how to help siblings along through a process like this. A heartfelt thanks goes out to our family, especially our parents, who were vital throughout all of it and to our close friends who were a great source of encouragement and support these past few weeks. Kailey now proudly talks about her superhero heart and we, as her parents, couldn't be more impressed and thankful with the true superhero that she is! Our Good Friday was an especially, well, good one spent with family—just the way we like it. 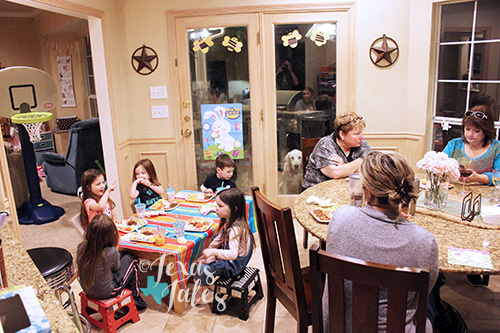 Earlier this week, our family dinner plans changed a bit and I offered to host the casual gathering at our place. I grabbed a ham at the grocery store and gave the house my best once over as quick as I could, which didn't go as smoothly as planned when I came down with a case of food poisoning (never again, local Thai restaurant) on Thursday afternoon. But the husband rallied and helped get everything in order and it all turned out just fine! I returned to the Land of the Living by Friday morning after nearly 12 straight hours in bed. (Cannot remember the last time I did that.) The ham was in the oven by 3:30pm and my parents, plus my sister, Sabrina and the quad's adorable cousin Rayne all came over to celebrate. The kids were super excited to see Rayne who, I later learned, was planning to pick a visit to our house over a trip Six Flags if she had to! What a sweet girl! Fortunately for her, she was able to spend the day at the amusement park and then come join us afterward. 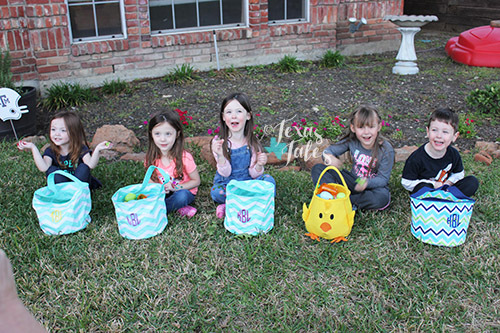 Summer (my sister) and Sabrina brought adorable gifts for everyone, large stuffed eggs for the egg hunt and a Paw Patrol mega block set for the kids! 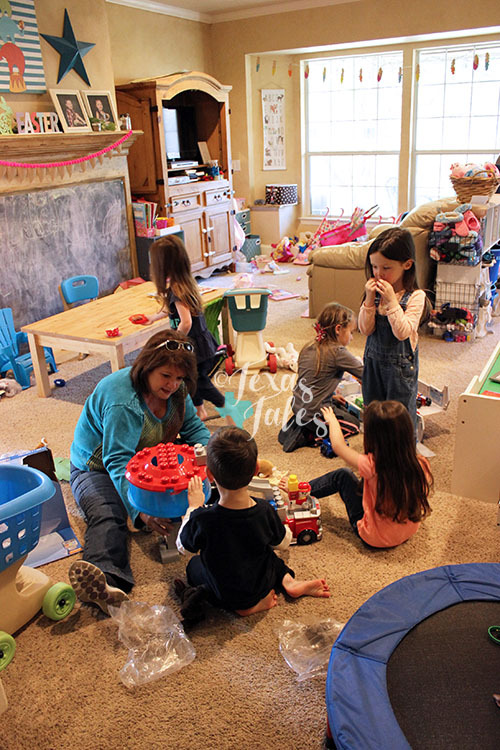 That entertained them for over an hour and all five kiddos played so well in the play room together. Sabrina helped me finish stuffing our eggs then she, myself and the husband divided and conquered the front yard, making it look more like a chicken coop gone golden with so many eggs everywhere. 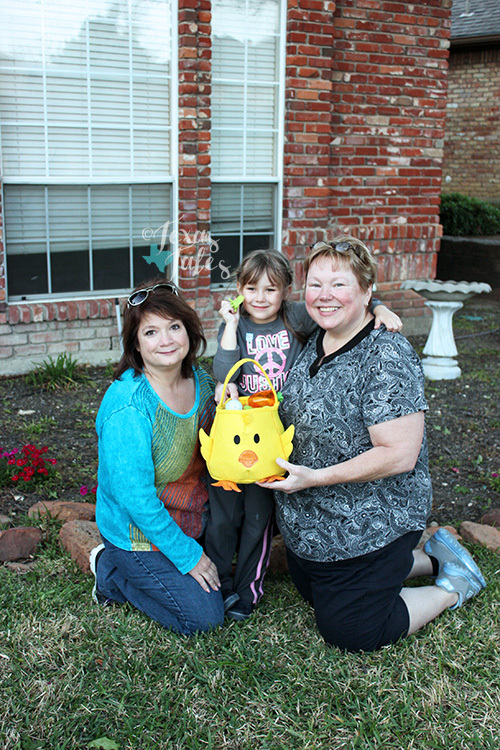 The egg hunt was a huge success—we had over 200 of them!—and each kiddo filled their basket up. I loved it! This year, the quads really had it down too. 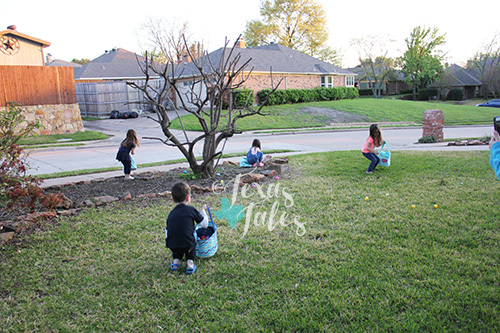 They didn't try to open each egg as they picked it up and Rayne helped by setting a good and quick example! 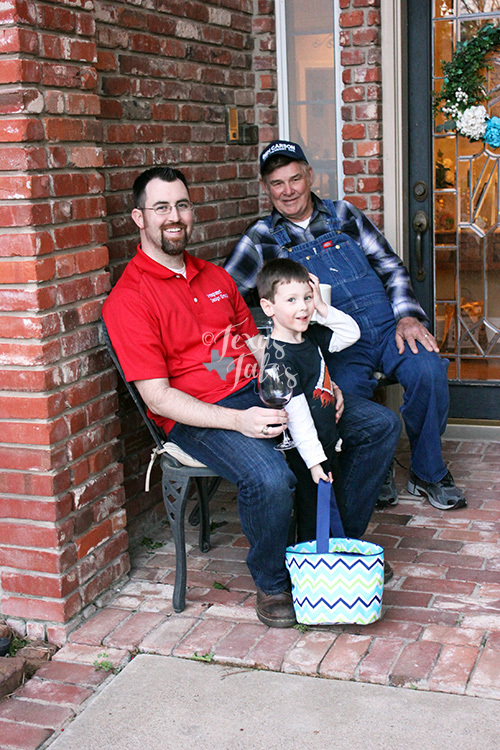 After the egg hunt, we stashed the baskets and sat down for dinner in our kitchen. Ham on the bone, baked beans, homemade potato salad, fruit salad, rolls and peach cobbler with ice cream for dessert. 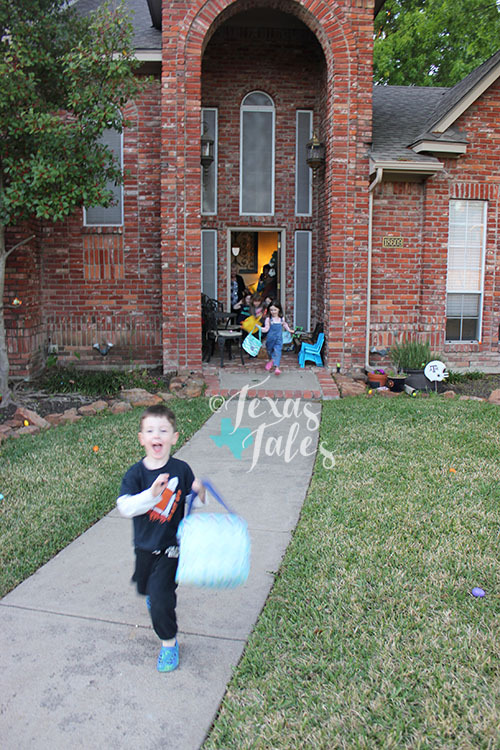 The kids then played pin the tail on the bunny before watching Brer Rabbit, while the adults got a little down time, chatted, play on my Snapchat (find me under TexasTales!) and sipped wine. 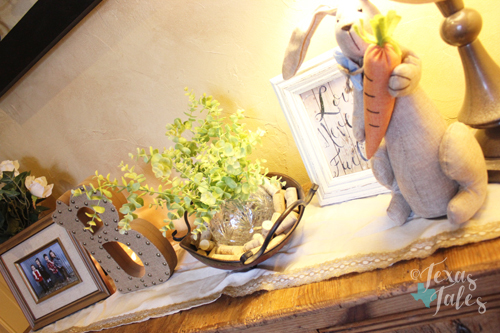 Later this weekend, I'll share a recap on the rest of our Easter festivities and what's in the quad's Easter baskets, but for now here's a snapshot of the only decor I managed this year. 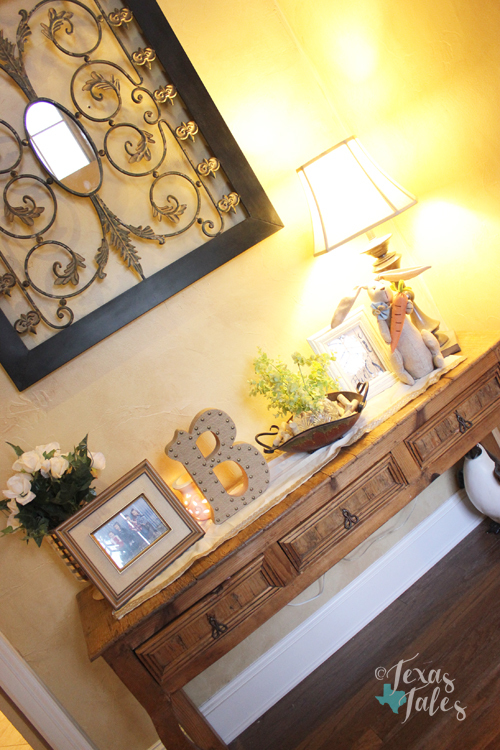 But it's on our entry table by the front door, so I figured it counts double, right!? 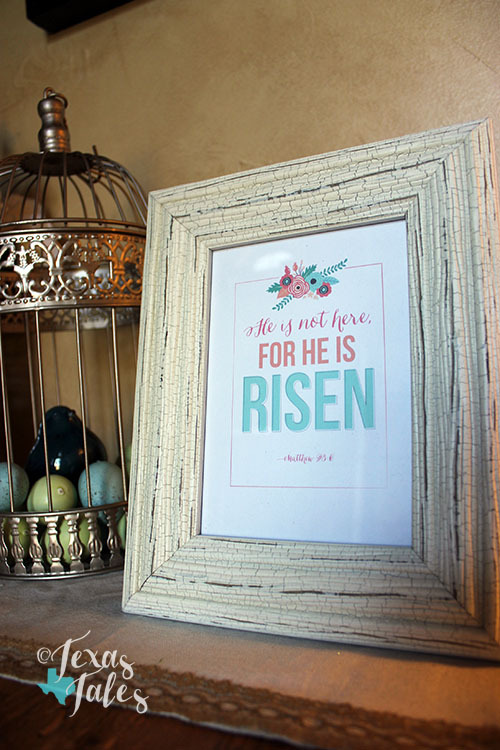 The cute Easter printable can be found here; I sized mine down to a 5X7 to fit my frame. 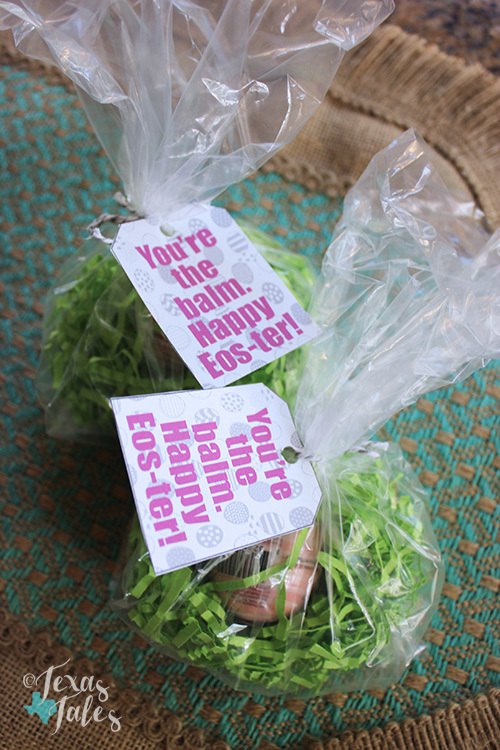 Earlier this week, the kiddos had their class Easter egg hunt at school and I created these simple printable tags for a quick and cute teacher Easter gift. I've got 'em for you in a PDF download right here! They're great for teachers as well as friends and family, too. 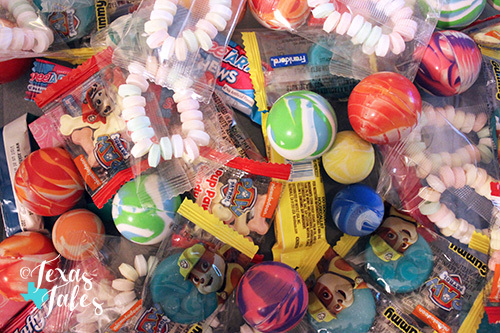 You can never have too much lip balm or, if you're like me, you just want all the coconut things. 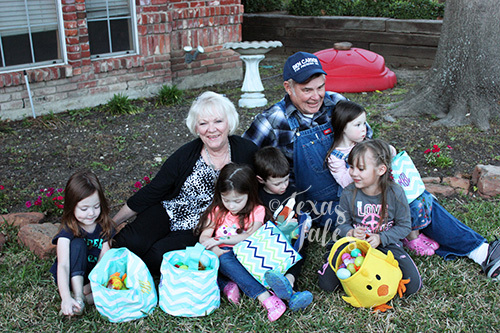 For the past two weeks or so, the husband and I have been discussing what Easter is really about (not just the Easter bunny) with the kids and reading some books about Jesus and His life and they're understanding far more than I expected they would. 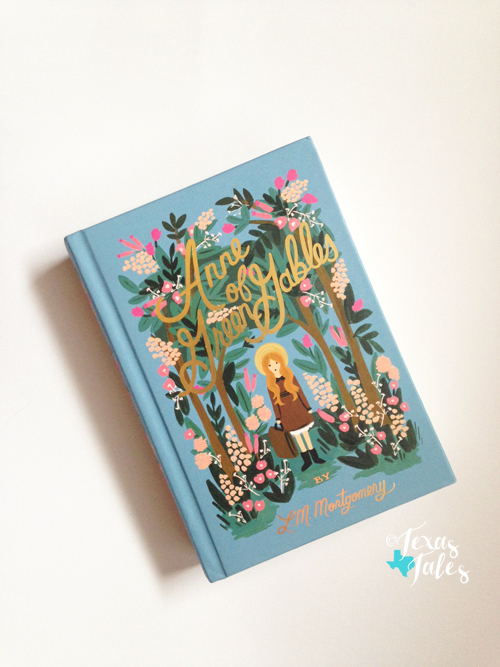 We love all the cute Disney 5 Minute story books, so I was excited to find Bible Stories in 5 Minutes, which will be great to convey passages and lessons in terms the kids can relate to. 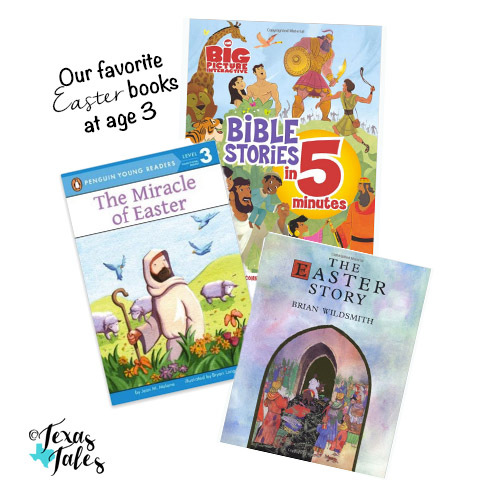 Other library reads we've picked up that have been good for us include The Miracle of Easter by Jean M. Malone and The Easter Story by Brian Wildsmith. It's definitely been important to us to take a moment here and there to remember the sacrifice Jesus made on that cross that day, and how willingly He traded His life for ours. To know that I am loved and cared for so strongly and passionately—as are you—is a powerful revelation and one that certainly carries me through. And it's a truth I intend for my children to know, trust and love with their whole hearts. 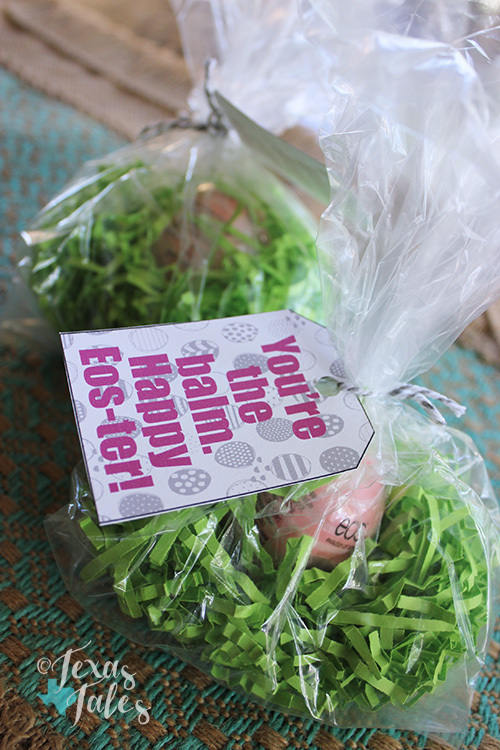 Happy Easter to you and yours! He is risen! PS - Need some extra weekend reading? 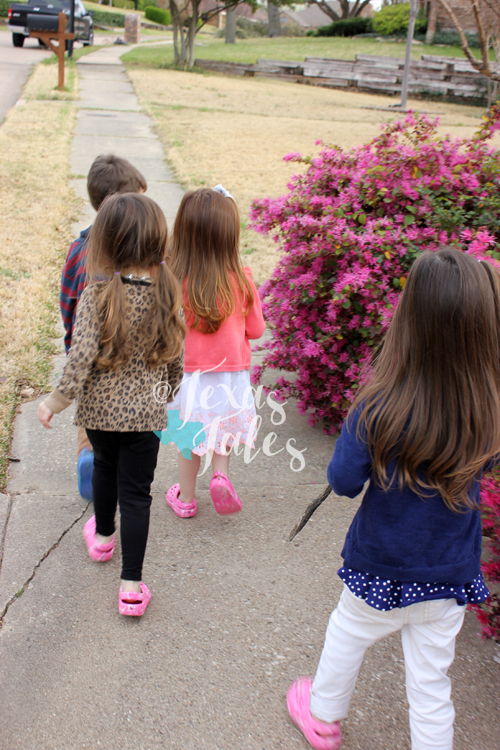 Check out my guest post on fellow mom of multiples blog, Capri +3, where I share 10 ways to make life easier with kiddos! I've always been a lover of food and have long hoped to foster a healthy appreciation for good fare in that of my children—but little did I know prior to becoming pregnant with the quads that I'd be prepping far more meals then I thought when we set out to become parents! Thankfully, the kids have fairly well developed palates and favorite foods range from typical tot stuff like peanut butter sandwiches and chicken nuggets to oven roasted salmon, olives and hummus. You may have previously been a fan of my Tyke Bites posts, which will still continue periodically and cover a random day of meals in our household. 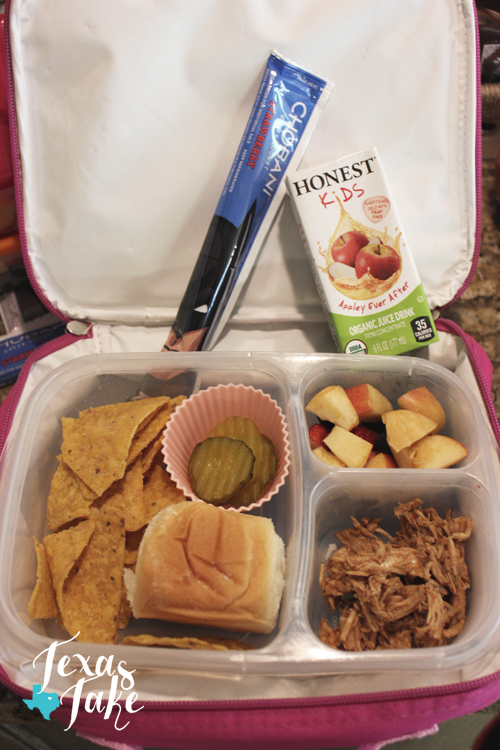 For now, though, I'm introducing my School Lunch Bites series that'll feature simply that—the latest school lunches that have been packed into my crew's lunch boxes for their day at school. They currently only go to pre-school twice a week and the other days we eat similar style meals at home. I take photos of the lunch box food as I remember, so not all posts will feature the actual meals made that week and some may be in random order! 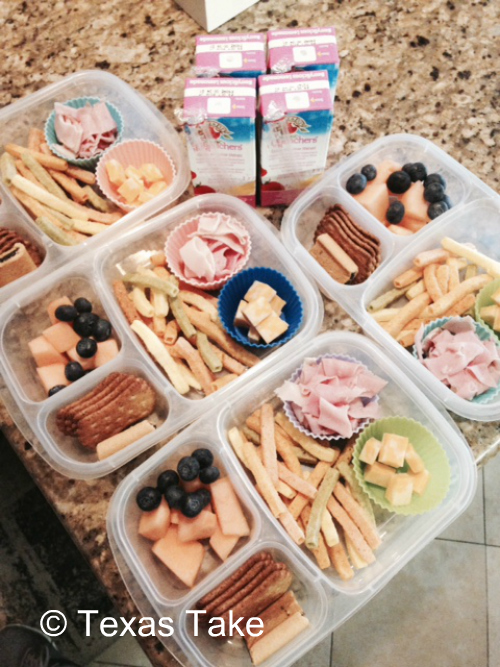 I also get a lot of good ideas from mama blogger Lisa of What Lisa Cooks who, ironically, has two sets of twins! So she comes up with plenty of ways to reinvent boring lunch box combos that are perfect for when I need inspiration. Because I've been asked so many times on Instagram and Facebook, here are sources for all the packing items I use! Lunch containers: I love these plastic bento-style containers from Amazon. They even come in a set of four so it's meant to be! I use them so often I'll likely purchase a second set soon, especially when we bump up to three days of school a week for pre-K starting this fall. The containers a great size for accommodating various food shapes and amounts, just beware that they aren't spill proof! I don't pack liquids in these (like soup, applesauce or yogurt) unless I've got it pre-packaged in a plastic ramekin or something. Liquid containers: I have Goodbyn containers I use for when I'm packing liquids or things that can leak. Baking cups: When packing small pieces of cheese, turkey, nuts or other such items, I'll often use silicone baking cups to help separate and contain them. Lunch boxes: All of these came from Ross and TJ Maxx and are some of the kids favorite characters. With that, here we go...School Lunch Bites post numero uno! 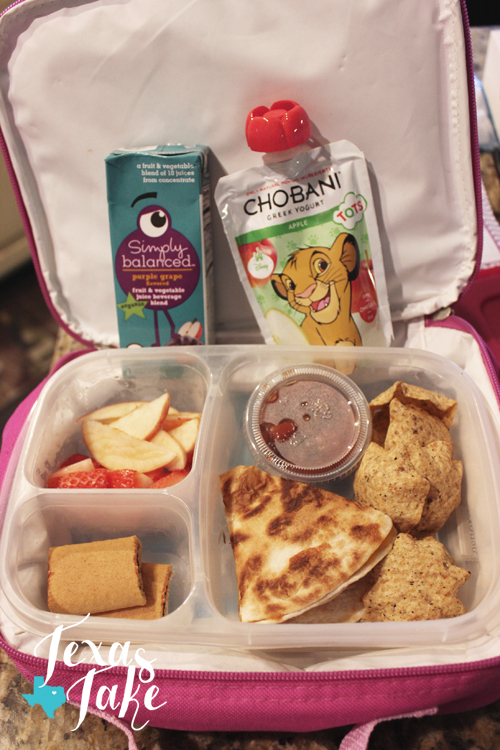 THE DISH: Cheese quesadillas, whole grain chips with salsa, apples, strawberries, fig newtons, yogurt squeeze pouch, juice box. 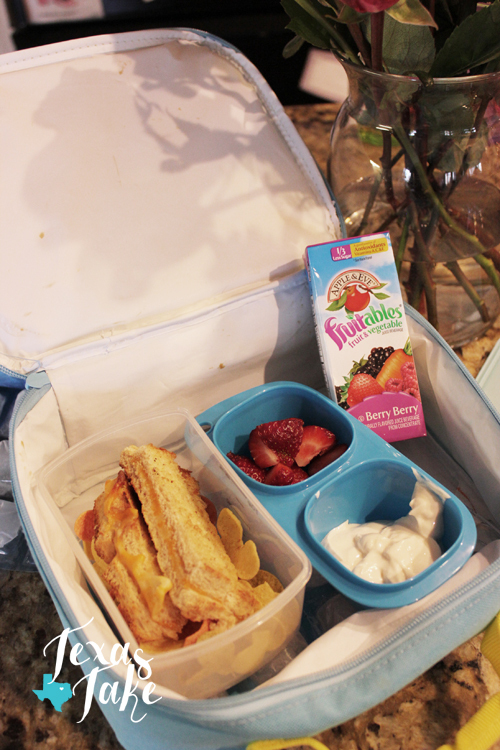 THE DISH: Grilled cheese (cut into "sticks"), veggie chips, strawberries, yogurt, juice box. THE DISH: Turkey, cheese, veggie straws, blueberries, cantaloupe, whole grain crackers, fig newton. 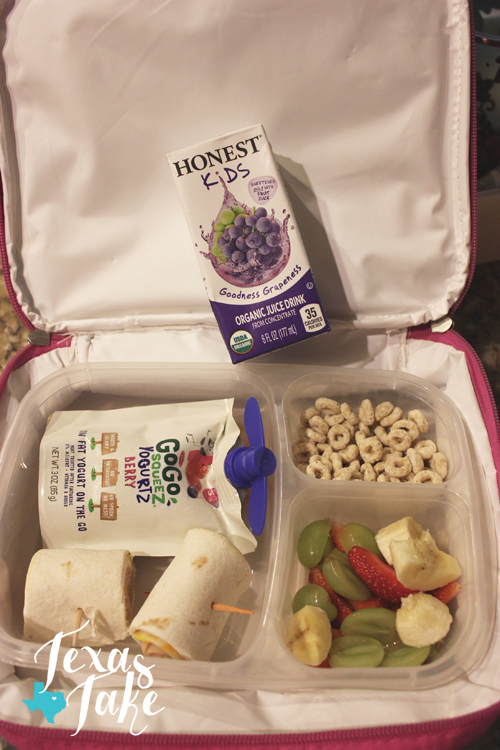 THE DISH: Tortilla roll-ups with turkey, cheese and mustard, bananas, grapes, strawberries, frosted cheerios, yogurt squeeze pouch, juice box. THE DISH: Hawaiian bread roll, leftover barbecue chicken, Doritos, pickles, apples, strawberries, Chobani yogurt tube, juice box. Thanks for stopping by and happy eating! The weather in Texas has dutifully warmed up even beyond our normal temperatures this spring, making me think our summer is going to be that much hotter. But for now we're all basking in the easy-going mid- to high-60s with a few afternoons peaking at 70 degrees. Flowers are blooming and I've broken out all the kids new sandals for the year. I wanted to go into the weekend with just a quick post highlighting some of my favorite photos of our spring thus far, like a pretty arrangement of grocery store blooms I picked up and displayed on a $3 Target tray on our kitchen island. Flowers always make me happy! 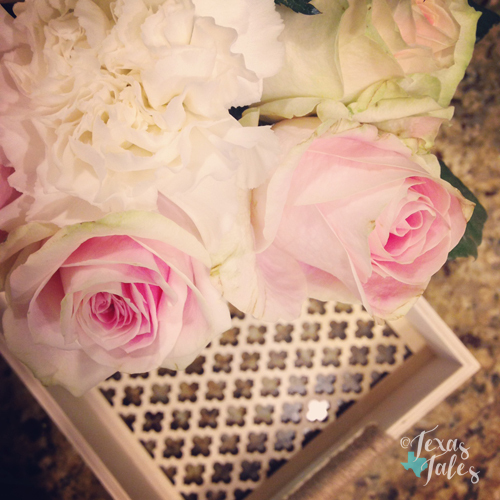 If blooms are on sale or come in a bunch, I often split them up into various arrangements and use roses or carnations or even greenery as filler to get more bang for my buck. 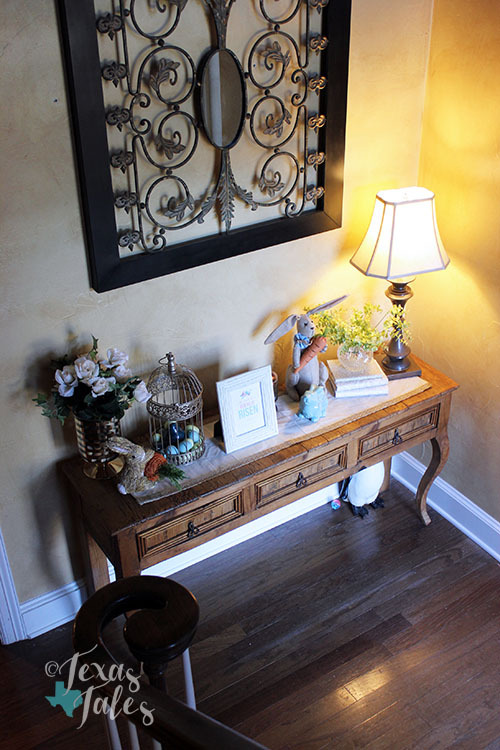 So far, I've got lots of flowers and greenery—both real and faux—scattered throughout the house to lend a fresh air for the new season. 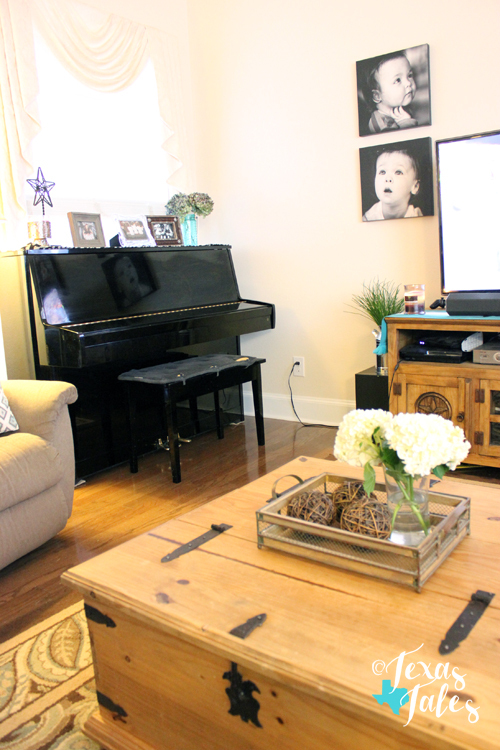 I even saved a couple of blue-green hydrangeas and dried them out so I could continue to display them on top of my piano because they were so pretty. 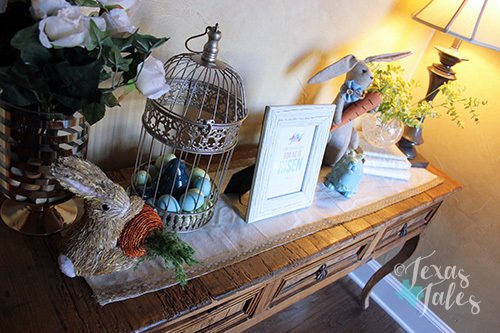 Our entryway table hasn't been officially decked out for spring or Easter, but for now it's got some fresh decor with more faux greenery, framed photos and a burlap bunny all in neutral tones. 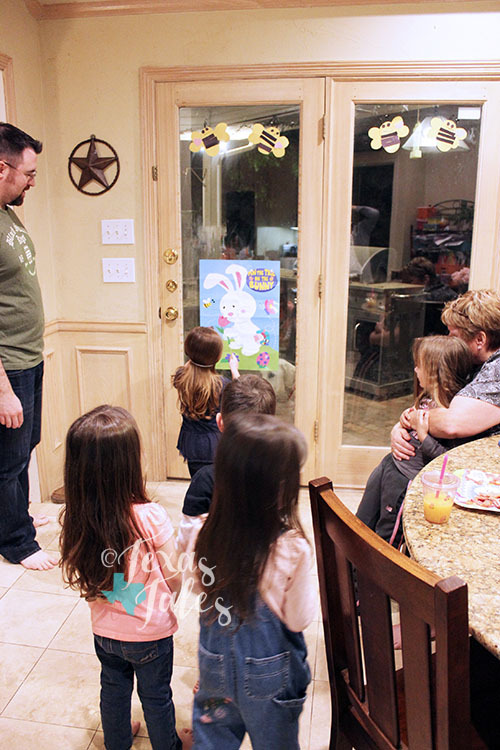 I've got a DIY Easter banner to string along the wall hanging and some more cute bunnies the kids will enjoy looking at. 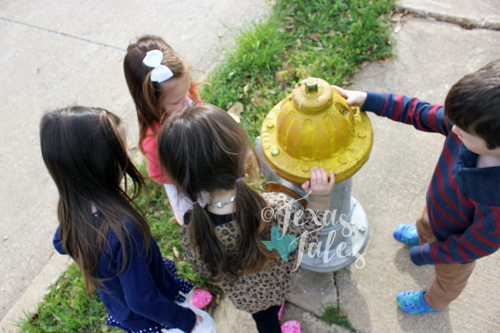 Speaking of good weather, today the kids and I enjoyed a walk through our neighborhood after their naps. 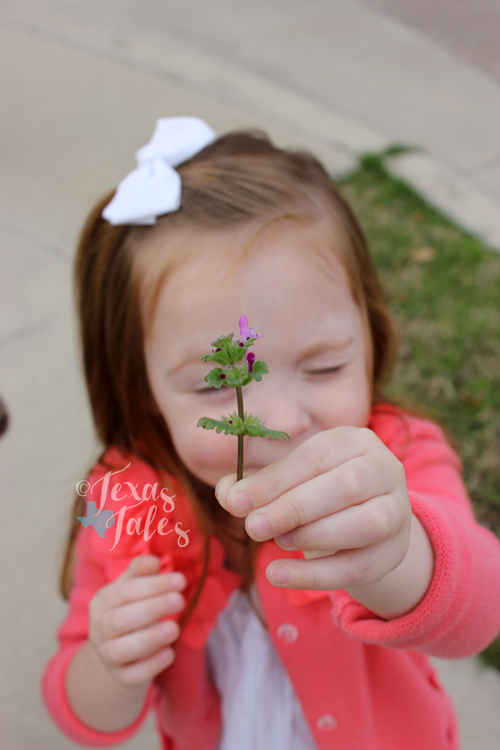 They loved picking up sticks, weeds flowers, acorns and other nature finds. 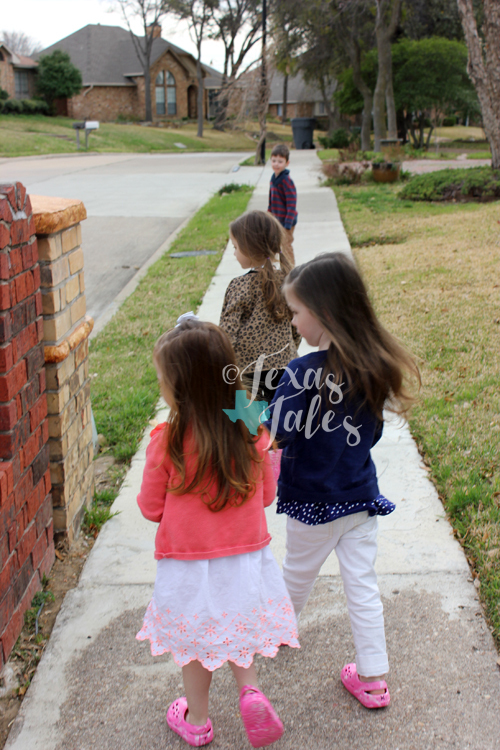 All four do a fantastic job of staying on the sidewalk, not running too far ahead and crossing the street carefully with me. It's a great opportunity to practice basic safety habits and get a little fresh air and exercise! Plus, the crew broke in their new shoes I get from Wal-Mart each year (one of the few times I go there, I'm a Target girl all the way!). They can easily slip the shoes on themselves and the kicks are perfect to wear around the house and yard in the summer. They're plastic slip-on, clog-type shoes for less than $5 each and can be hosed off and dried with a towel for easy clean-up! A couple weeks ago, I got a chance to spend some one-on-one time with Trystan. 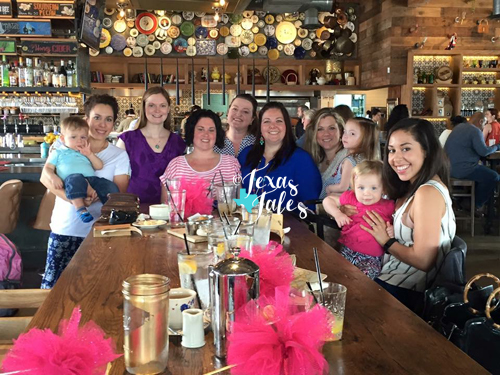 We went to brunch with some of my girlfriends and a few of their kiddos then did a little shopping for the afternoon. I love any exclusive time I get with my kids! 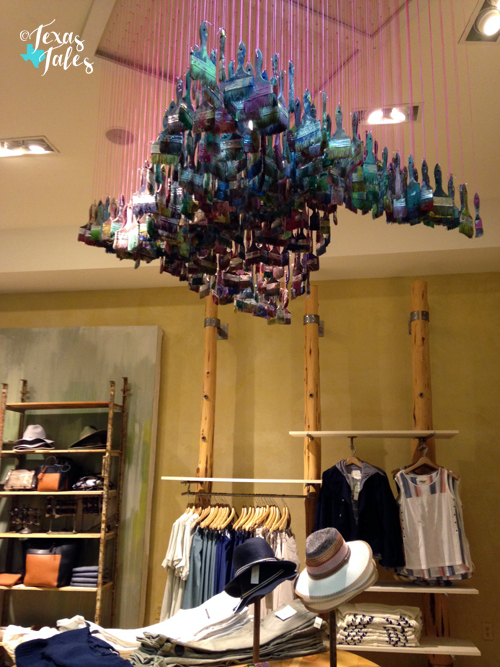 We stopped in at Anthropologie and Trystan loved their unique displays, like a collection of paint brushes suspended from the ceiling. 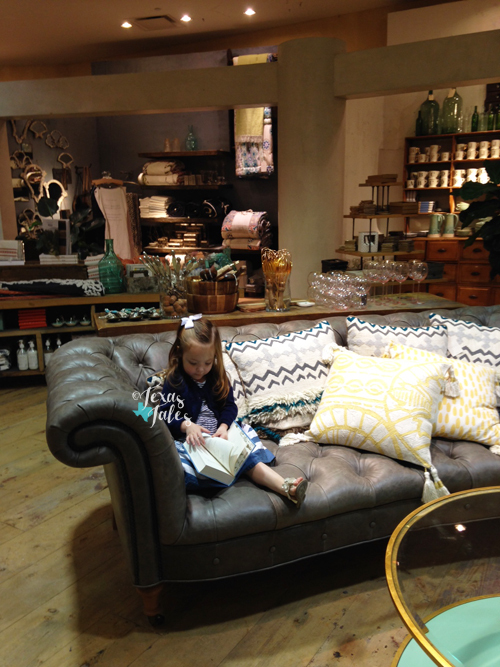 The beautifully illustrated books caught her eye and at one point she settled onto the couch to flip through one of them. I was so smitten that she was smitten so we ended up purchasing Anne of Green Gables and I've been reading a chapter to the kids each night before bed. They really enjoy "chapter books," as they call them, and between myself and my mom they are getting to hear many of the classics read. 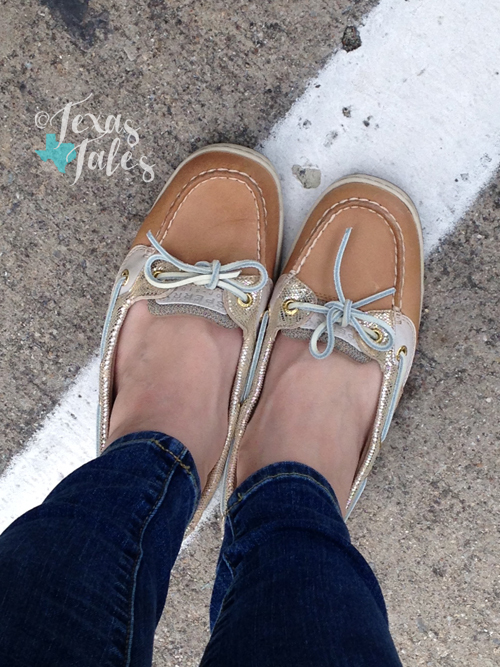 I've only ever owned one pair of Sperrys, so when I saw these gold-toned beauties at TJ Maxx recently I snatched them up. Much less expensive than full-price versions and very comfy for days full of walking! 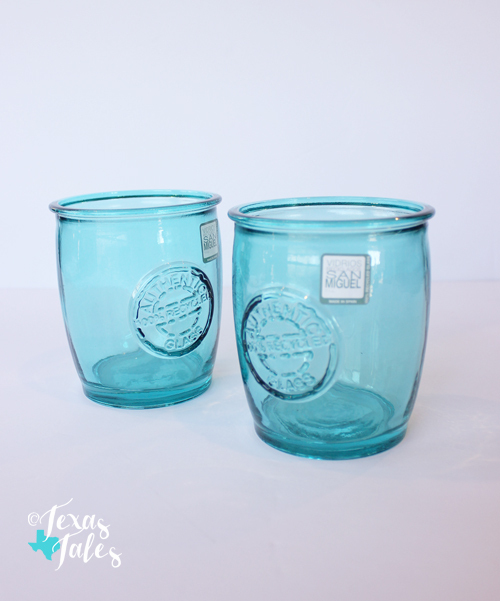 On a separate round of errands, I made a few returns at Marshalls and browsed around before leaving when I found these pretty blue glasses for just $1.99 each. They are 100 percent recycled glass (which is what it says on the front) and the husband and I decided they're perfect for our new whiskey and coke glasses! 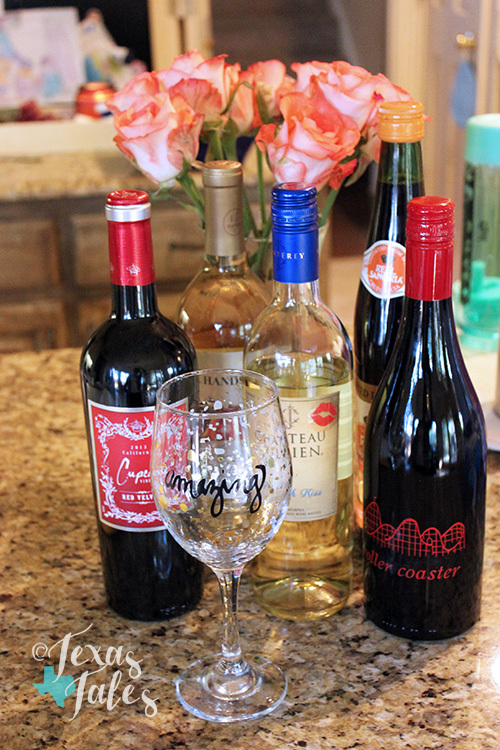 We like to mix up a few, especially on the weekends when we do a DVR late night binge after the kiddos are in bed. 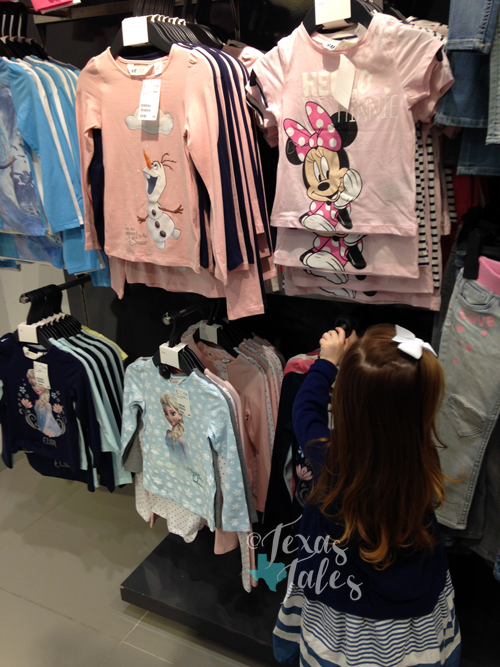 As spring rolls on, we look forward to more outings and little adventures with the kids and have really enjoyed watching them learn so much and so fast at school right now. Next week is spring break and we've got some bonus time to spend with grandparents and our quad buddies, but first up is a day date I'm really looking forward to with the husband tomorrow! The quads turn four years old at the end of May, which is so hard to believe. They are truly turning into big kids now! I've settled on a dinosaur theme for their party and already have so many fun ideas and DIY projects I hope to accomplish for the bash. The kids are excited about the dino-centric day and I've already purchased their first gift! These four sweet babies are the best of friends and we see evidence of that every day. Just this evening, while cleaning up the dinner dishes, the husband and I heard Harrison and Trystan getting frustrated with each other in the play room. Then Harrison says in a totally calm voice, "Trystan, I love you very much, but you need to build your own lego tower!" We never know what they're going to say! One of our favorite post-dinner laughs often comes from asking the girls to clean Harrison's face if he's thoroughly enjoyed his dinner and dessert and left evidence of it all over his mouth. The girls will each grab a baby wipe then take off giggling and chasing after Harrison who playfully screeches his protests but eventually lets them all have their turn. It's the sweetest thing! 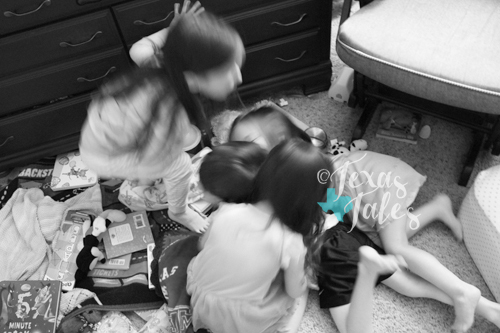 The other night they had a tickle fest and the girls are piled on top of their brother trying to get the biggest laugh out of him possible and he was the best sport, letting them poke and prod while laughing hysterically. Nothing brings the husband and I more pride and joy then seeing the unique and incredibly close bond that our children share with each other. It's time to pour another glass of wine and settle onto the couch with the husband and relax—the long week is officially over!